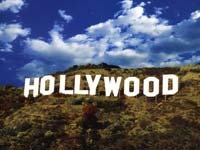 Los Angeles citizens and some officials are in a serious mood to protect a huge swath of land near the world-famous Hollywood sign from being developed into luxury homes. Trust For Public Land president Will Rogers said a nature conservation group secured an option to buy the rugged 138-acre parcel known as Cahuenga Peak for about $12 million from Chicago area-based Fox River Financial Resources. The consortium put the land on the market two years ago for some $22 million. "The real estate meltdown has brought a number of properties that should never have been developed back onto the market at very favorable prices," Rogers said. But, he added, "not everything that we're seeing is as iconic as Cahuenga Peak, being the backdrop to the Hollywood sign." Fox River did not answer a call seeking comment. Real estate agent Ernie Carswell, who had been handling the property, did not return a message. The Trust for Public Land has already raised about $6 million. Rogers says he's confident it can raise the rest before the option expires in mid-April, although he acknowledged that the same economic forces that were driving down land prices also made fundraising more difficult. If it succeeds, the group intends to transfer the land to the city of Los Angeles, so it can be incorporated into the adjacent 4,200-acre Griffith Park. The sage-covered mountaintop property, which begins just beside the sign's "H" and continues west along the Hollywood Hills' scenic ridge, was once owned by movie producer and industrialist Howard Hughes. The property remained undeveloped in the billionaire's trust for decades. Most hikers and residents assumed the land was part of Griffith Park until Fox River quietly purchased the peak from Hughes' estate in 2002 and had the property zoned into four palatial home sites. The new owners pitched the sites to well heeled prospective buyers by advertising their 360-degree panoramas of the Los Angeles Basin and the San Fernando Valley. But city officials and many residents said that building homes on the peak would ruin one of the city's most famous views. "The city of Los Angeles wants to acquire this land, not only to maintain the view of the Hollywood sign, but also to preserve open space, hiking trails and wildlife corridors for the future health of our great city," Councilman Tom LaBonge, whose district includes Cahuenga Peak, said in a statement. The money already raised for the land's purchase come from city and state park funds, as well as private donors, including a $1 million contribution from jeweler Tiffany & Co.'s philanthropic foundation. If the group fails to raise the final $6 million before April 14, the property will go back for sale on the open market.